OTEH: “Local and international investors need to understand that things have changed” in Nigeria. On the fiftieth anniversary of Nigeria’s independence, one key player who wants to see the oil-rich country truly fulfill its promise is Arunma Oteh (MBA ’90). A former official at the African Development Bank, Oteh is now the director-general of Nigeria’s SEC and the country’s chief financial regulator. 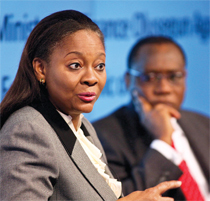 At a conference in London in September, Oteh revealed her intention to strengthen the country’s capital markets in order to reduce an overreliance on oil exports, spur economic development, and “build an economy that works for the ordinary citizen of Nigeria” (BBC, September 13, 2010). Dubbed the “Iron Lady,” Oteh announced last summer that “local and international investors need to understand that things have changed.” She sacked the two top officials of Nigeria’s stock exchange (the second largest in sub-Saharan Africa but far smaller than South Africa’s) and then declared that she would bring charges against some 200 other individuals and organizations allegedly involved in capital-markets abuses, the BBC reported (July 1, 2010). Oteh also announced that she plans to boost the bond markets in Nigeria, which have long been neglected in favor of equities. “We need to build a strong foundation for a vibrant fixed-income market,” she said.